Zardoz the Amazing always steals the show! MichiganHauntedHouses.com recently sat down with Thomas Knuth of Haunted Variety Show, to discuss what's happening for the 2018 Halloween Season! 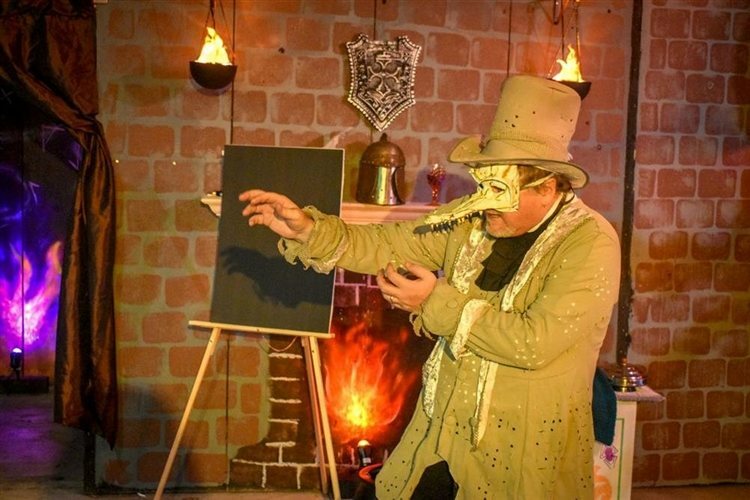 What's new at Haunted Variety Show for 2018? Do you have any new rides, attractions, or special features that Haunt Seekers should know about? The Haunted Variety Show is a 40 minute performance by trained theater actors who keep children smiling, laughing, and participating. All guests are encouraged to arrive in costume and will be participating in the show. Zardoz the Amazing will perform along with the Evil Sea Witch and Sir Good Knight. This brand of comedy is fun for all families. Perfect for kids 12 and under. The Haunted Variety Show is new for TreeRunner this season but we have brought back three of the most talented actors from our former Haunted Trail. Each of our performers loves to entertain and keep the energy alive! What differentiates Haunted Variety Show from other local haunts in Michigan? There is no blood, guts, and gore. This is a charming affair that will not scare but leave lasting memories for the entire family. This event provides covered seating within the private performance area. How long has Haunted Variety Show been in business? Can you tell us a bit more about Haunted Variety Show's history? The Adventure Park has been hosting fall Halloween events for children for 5 years. What's your favorite experience since opening Haunted Variety Show? This show really charms children and parents. How long is a typical haunt experience at Haunted Variety Show from start to finish? 40 minutes with a meet and greet/photo opp after each performance. On a scale from 1 to 10, how scary would you say Haunted Variety Show is? Why? 1. This is a theatrical performance in Halloween theme. Does Haunted Variety Show's property have any real haunted history? Do you have a spooky encounter you'd like to share? No history here, other than five seasons of great Halloween public events. We realized that over our 5 years of operating an outdoor Haunted Trail at two different locations, that participants truly enjoyed interacting with all of our performers. Although the rain over the last two Octobers has drastically impacted our ability to host an outdoor trail, our covered and private performance area keeps folks dry and embraces everything they have enjoyed at TreeRunner in the past. How has new technology (i.e. animatronics, special props, etc) helped you to enhance Haunted Variety Show? Stage props, set decoration and fantastic painted scenery. Can Haunted Variety Show accommodate large groups? How many people can experience Haunted Variety Show together as a group? Does Haunted Variety Show offer any special deals, discounts, or coupons? The performances are offered by reservation only. $10/person. Children under age 1 are free. Anything else you'd like to let us know about Haunted Variety Show? There are very few Halloween programs in the area that are specifically designed for children. If you have little tikes that love wearing their favorite Halloween costume, bring them out to this event. You will not forget it.